The last Ladies Professional golf major of 2009 is in the record books. 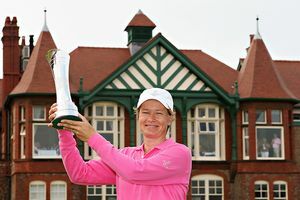 Catriona Matthew won the Women’s British Open by three strokes on Saturday, earning her first major title just 10 weeks after she gave birth to her second child. The 39-year-old Scot birdied three straight holes on the back nine of a 1-over 71 that left her at 3-under 285. Karrie Webb of Australia closed with a 68 to finish second. Paula Creamer (71), Hee-Won Han (70), Ai Miyazato (73) and Christina Kim (74) tied for fourth place at 289. Actually Creamer, Han, Miyazato, and Kim tied for 3rd not fourth place. Either that or the invisible woman shot 288 and a fraction to finish 3rd. At first glance it looks like Matthew coasted to victory today. She certainly did not. Matthew faced serious challenges during the last 18 holes from Webb, Creamer, and both Miyazatos in the field Ai and Mika. With 6 holes to go Matthew was tied for the lead after playing the first 12 holes in three over par. Matthew then birdied 3 straight holes. A bogey on 17 couldn’t prevent Matthew from becoming the first Scottish born woman golfer to win a professional major championship. Matthew’s win is pretty incredible on several levels. She only gave birth ten weeks ago. (Matthew also won an unofficial LPGA event in Brazil at the beginning of 2009 while pregnant with her daughter Sophie. Has a golfer won a tournaments in the same year, before and after giving birth in LPGA history?) In addition to that, Matthew and her husband had a narrow escape from a hotel fire in France less than two weeks ago. The LPGA’s Major Championships are done for 2009, but there is still plenty of golf to go. In three weeks, the United States will face off against Europe in the Solheim Cup matches. The week after that, the LPGA is back to playing 54 or 72 hole tournaments. Player of the Year and #1 money winner for 2009 are still very much up for grabs.